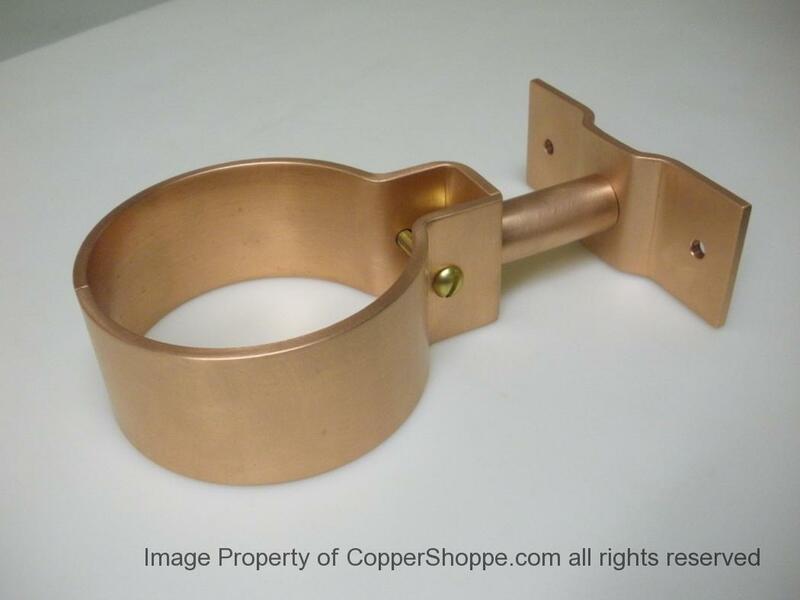 Threaded Rod Downspout Brackets will come with the brass threaded rod and copper tubing cut to proper length(s) if you have specified the stand off dimension(s) for your project. We will individually package the cut to length components and mark the packages with the specific stand off dimension for your easy recognition. First determine the minimum stand off dimension of your downspout brackets. The minimum stand off dimension of most threaded rod brackets is 1.5″ if you do not use any tube section to assemble the bracket. This dimension may be as much as 1-5/8″ or as little as 1″ depending on the bracket style and material thickness or special order requirements. For this example we will use a minimum stand off of 1.5″. Next determine the target stand off dimension of your downspout. for the distance from the wall surface to the rear of the downspout. Once you have determined your stand off dimension you then cut the brass threaded rod and copper tube to proper lengths. In most cases you will cut the brass rod to a length that is about 1″ shorter than your target stand off dimension and you will cut the copper tube to a length that is 1.5″ less than your target stand off dimension (our minimum determined stand off for this example) . So we would cut the brass rod to 6″ and the copper tube to 5.5″. Fasten the rear mounting bracket portion of the downspout bracket to the wall surface using suitable fasteners. The holes for mounting are designed to accept 1/4″ fasteners. Once the rear mounting bracket is attached to the wall – screw the section of brass threaded rod that you have previously cut to length into the mounting bracket. Next slip one brass washer (supplied hardware) over the rod and push it back as to rest against the face of the mounting bracket. Next slip the previously cut to length copper tube section over the brass threaded rod. The brass washer will help position the tube to be centered to the rod. Next insert a second brass washer at the front side of the brass threaded rod and just into the copper tube. These two washers will keep the tube located so as to be on center of the brass rod. Next place the side of the downspout bracket that has the mounting leg on to the brass threaded rod and install a 3/8″ Brass Nut (supplied hardware) to fasten. The brass washers will keep the copper tube on center but you can nudge the tube to best suit your needs prior to final tightening of the Brass Nut. Tighten securely. Next insert your assembled downspout into the bracket. Final assembly of the bracket is to place the remaining half of the downspout bracket over the downspout and fasten with a 1-3/4″ long Brass Screw, Silicon Bronze Lock Washer and Brass Nut (supplied hardware). AutoClears do not come with any pre punched holes for mounting. Most Contractors Position the AutoClear Box at the desired elevation and Rivet in place to the Downspout. you must drill a hole through the box at the point you wish to fasten. In most cases this will be at the rear side of the AutoClear Box. Hint: Most contractors prefer to fasten at a mortar joint for brick facings. In some specialized installations this hole may be on one of the sides. that would directly align with one of the blades. Your fastener should Ideally be placed on center (of the width of the box) so the the fastener will then be located between the number 5 and number 6 blade pieces. The inlet side of the AutoClear is designed to let your downspout simply slip fit into the AutoClear without the need to crimp the downspout. Also this feature lets you add AutoClears to existing installations as you can easily position the AutoClear once you have made the appropriate cut out on the existing downspout. Do not run the downspout on the inlet side down past the water routing beadlocated at the bottom portion of the inlet. If you run past the bead – the water routing bead will not do its job – (flush the water to the center) plus if you really run too low (actually inside the interior of the AutoClear Box) you may not easily remove the blade assembly (option for winter months if desired). 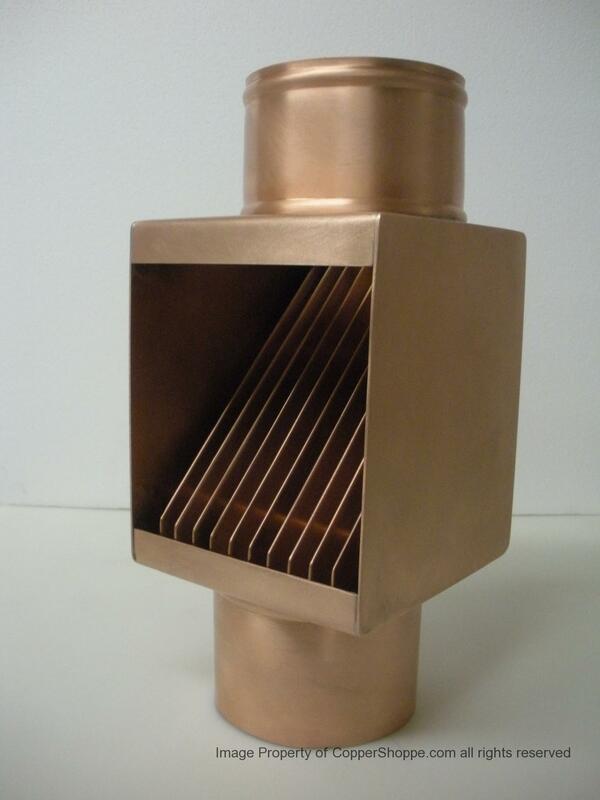 AutoClears are standard designed with a 4″ Round outlet (regardless of downspout inlet size and configuration) which will transition into a standard drain crock neatly. The outlet is sized to normally fit inside a 4″ Round Downspout so that you don’t have to crimp the outlet to get it to fit into a downspout section if the wall mounting surface will not allow you to position the AutoClear directly into your drain. so as to be positioned toward the drain crock center. 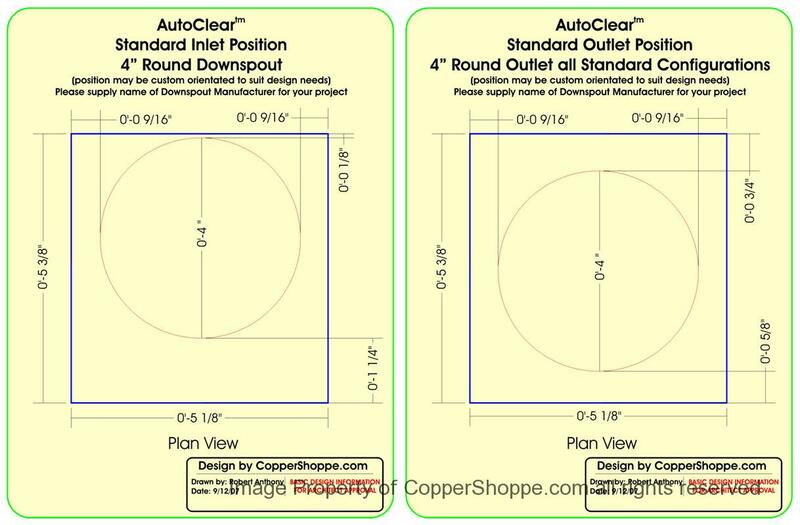 Since all products are made to order, Inlet / Outlet Size and Positions will be reviewed prior to production so that our AutoClears will meet your needs perfectly. Installed on the gutter before the gutter is installed! No more chalk lines and dry lines! No more Double Moves! and you will have no call backs for bracket failure! utilizing dry lines or your standardized installation procedures.